Since last Friday was a holiday, I experimented on a new recipe - Kueh Cara Berlauk. This recipe requires the use of a Kueh Cara mould but I didnt have one hence I used my mini muffin tin instead. 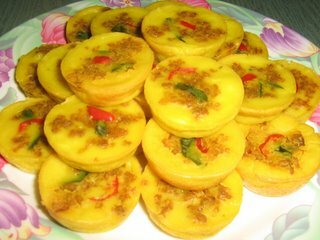 This is one of my favourite kueh. In fact, anything with mince meat is my fave. Anyway, as promised, moi dearest hubby, this savoury stuff - Kueh Cara Berlauk was baked with love especially for you. Heat oil in a pan and fry the onion, garlic and curry powder till fragrant. Add mince meat and salt to taste. Blend/Mix all of the above and strain. Preheat oven to 175 dec C and grease muffin tin. Pour batter into mini muffin tin 3/4 full. Put in a little mince meat. Garnish with spring onion and red chillies. Cover the top of tin with aluminuim foil and bake for 30 mins. Turn out when cook and serve on a plate.